Today we hear a great deal about Alzheimer’s disease, but relatively little about its discoverer. Its discoverer had little idea how famous his few case studies would become. Here’s how Alzheimer’s went from a medical anomaly to one of the most known and feared medical conditions in the world. Auguste Deter was only in her early fifties when she was first admitted to the Frankfurt mental clinic, but her mind had been deteriorating for nearly ten years. Up until 1890, she had had a normal life. She had married a railway worker, and the two had had one daughter. Their schedule was strained by the fact that he worked nights, but otherwise they seemed content. Then Auguste began having trouble sleeping. At first it was just restlessness. After a few years, she was unable to stay in bed. She started walking. She started dragging her bedding around the room. Finally, she started screaming at night. Her husband couldn’t take it, and she went to Frankfurt. Her file was to become a historical artifact—one lost until 1995, when the pharmaceutical company Eli Lilly recovered it in their records. Started in 1901, it was written half in Latin, and half in Sütterlinschrift, an archaic form of German cursive that fell out of favor in the 1940s. The story revealed is instantly, nightmarishly recognizable to contemporary readers. The file contains Auguste’s attempts to write her own name. It contains transcripts in which she tries to remember her name. It notes that she was unable to identify what she was eating. She would think steak was horseradish. A transcript of an early conversation with a doctor includes a moment when he shows her three fingers and then drops his hand and asks how many fingers he’s holding up. She correctly says “three,” but when he asks her how she feels, and then asks her again how many fingers he held up, she changes the subject, trying to remember her address. Later, the file notes that she would try to make excuses for her lapses in conversation, saying, “I have lost myself. Over time she became more agitated and frantic, then more passive, retreating into herself. She died in 1906. The doctor who interviewed Auguste upon her admission to the Frankfurt clinic was called Alois Alzheimer. He would have been about twenty-seven at the time, and had been working at the clinic for only three years. Before that he had been a personal physician and travelling companion to a mentally ill woman. This was relatively common practice for wealthy families. A combination of travel and the care of a physician was supposed to “cure” patients of their mental illness, no matter what it was. Although there’s no record of Alzheimer’s first patient, perhaps he learned during this trip that some illnesses of the “mind” were physical illnesses of the brain, and couldn’t be treated with a change of scenery. Alzheimer was not Auguste’s primary caregiver all through her stay, but even when he moved to a different city he took note of her condition. When she died, he had slices of tissue taken from her brain. Bringing them to his new facility in Munich, he examined them. He probably used the Golgi method, perfected by Camillo Golgi in the 1870s. It involved exposing the tissue of the nervous system to both silver nitrate and potassium dichromate. The two chemicals crystalized into silver chromate, which stained the tissues. 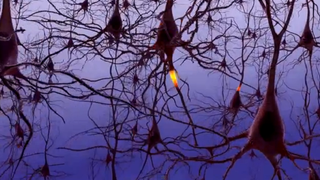 Looking through his microscope Alzheimer noticed little tangles of nerves, now called neurofibrillary tangles. He also noticed little plaques. The next year he presented his findings at a meeting of the South-West German Psychiatrists, and spent the next few decades of his life examining the brains of patients who showed similar mental decline. He found a handful of cases, although not all of their brains showed all of the physical signs of the disease. At first, the wider scientific community did not take note of his findings. Possibly he would have made more of an impression if he had lived longer, but he died in 1915 at 51—younger even than Auguste Deter. Of the three people on this list, Emil Kraepelin is the one with the decidedly mixed legacy. He was a great researcher, and a staunch defender of mental illness as a medical problem, not merely a result of a maladjusted childhood or a case of sexual neurosis. He was also a pioneer in the field of pharmacology, although his experiments mostly focused on how alcohol, caffeine, and chloroform affected patients. On the other hand, he believed that mental illnesses, being genetic and physical, were more prevalent in certain social groups—among them communists, anti-war pacifists, and Jews. Still he was a tireless promoter and educator about the physical causes of mental diseases. He was the first to promote Alzheimer’s work, and he often shared the workload. He and Alzheimer would both observe patients and specimens, and would trade off stints as the heads of research institutions. Alois Alzheimer discovered the disease, but Kraepelin presented it to the world. He put both the symptoms and the physical signs of this previously unknown form of dementia in textbooks, and presented it to societies for over a decade after Alzheimer had died. Kraepelin publicized the disease that today needs no further publication. He was the person who got doctors all over the world looking for something more than senility. Although we still have no cure for the disease, we at least have the benefit of a century of research.